Orange Panettone for sale. Buy online at Zingerman's Mail Order. Gourmet Gifts. Food Gifts. 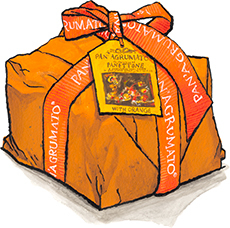 Italy’s traditional Christmas cake gets a citrus kick in the stocking this year, thanks to our friends at Agrumato and their mastery of producing citrus olive oils. The process is centuries old: press olives with whole citrus fruits—in this case redolent oranges from southern Italy—to create a light, feathery, clean oil that tastes of oranges. To make this airy, delicate Christmas cake, the producers use Agrumato’s orange olive oil instead of butter in the recipe, along with the traditional ingredients like candied fruit, raisins, flour, eggs and yeast. A sweet, bright, Christmas treat that gives the holiday a little Italian flair.